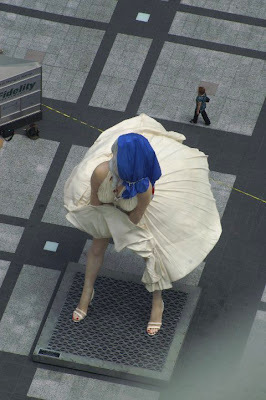 Our indefatigable correspondent Bob Johnson took the striking photograph you see above of a still unbagged Forever Marilyn, the 26th-foot-tall sculpture by J. Seward Johnson. In this WGN piece, Bob actually appears to get the answer to the question of what keeps the soaring structure secure. 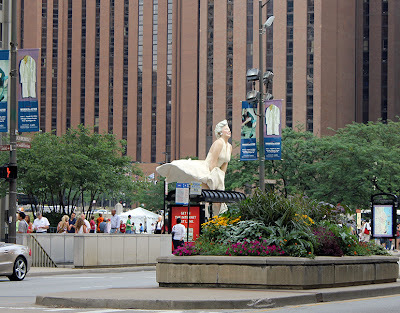 Turns out the base of the 34,000 pound sculpture itself weighs 10 tons, "engineered for a category 5 hurricane"
And speaking of hurricanes, if the intent of Forever Marilyn's promoters was to grab attention, they're already succeeding beyond their wildest dreams. Seemingly everyone in Chicago who puts finger to keyboard has felt compelled to add their two cents, and coverage has gone viral globally, even including this story by the Chinese news agency Xinhau depicting how Marilyn is going to be a favorite photo-op for the numerous wedding parties stopping their trolleys along the Mag Mile. 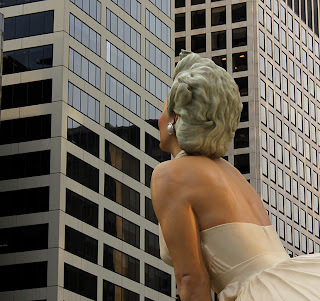 To me, what's most interesting is how the supersized human figure of Marilyn Monroe, a constant curving presence seemingly without a single right angle, plays out against the relentlessly rectilinear Miesian skyscrapers that compose her backdrop. What will be a continuing source of fun will be watching how visitors mug, vamp, and clamber to document their own relationship with Marilyn, this one made of sterner stuff than the flesh-and-blood original who succumbed to the irreconcilable contradictions between adoration and longing, objectification and obsession, delight, delirium and despair. Choose the pairings that fit you best.
. . . even as he turns his back on a distaught Kate Sullivan . . . This is going to be much much more popular than his earlier American Gothic inspired God Bless America. 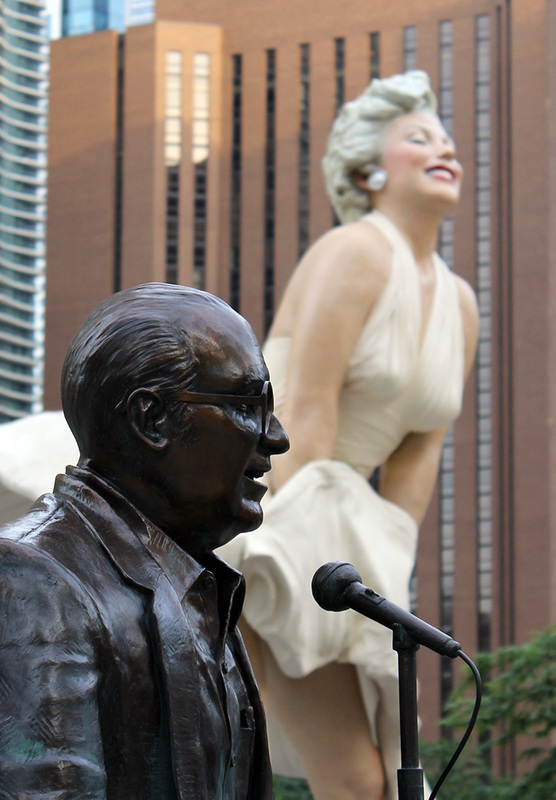 Someone needs to do the math on how many suburbanites will make an extra trip to see it. Michigan Avenue stores will get their retail $ instead of the distant mall. 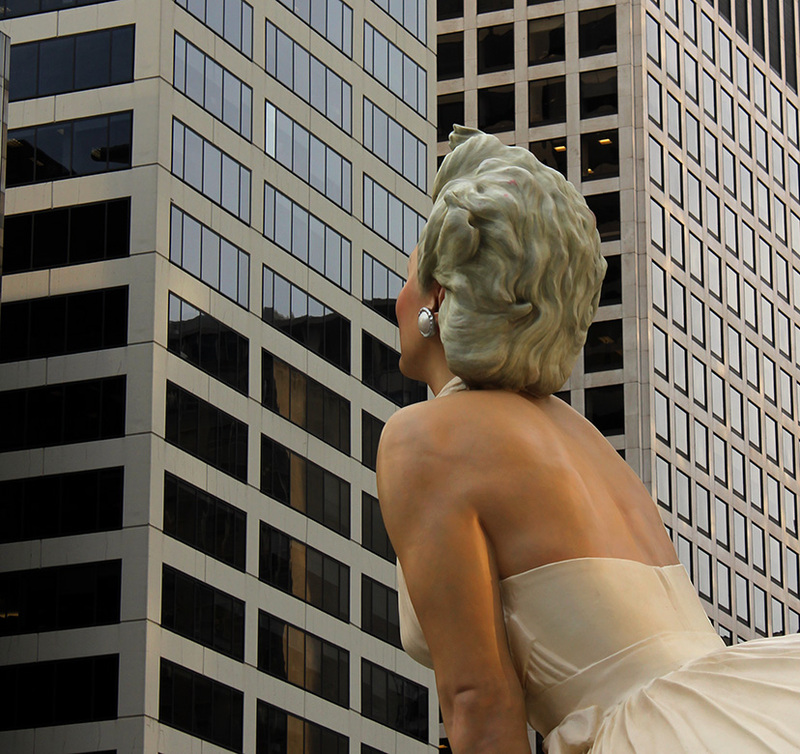 Marilyn continues to work her special magic. The house that cried "Mother"